One of the smallest micro-premature babies to have ever survived in South Africa, has been discharged from hospital. Baby Hope Daniels was born at 24 weeks, weighing a mere 300 grams in March this year. Born by emergency C-section, she's spent nine months at the Netcare Kuils River Hospital in Cape Town. Now doctors have deemed her strong enough to go home. The little girl is described as a miracle by her parents, who had been trying to have a baby for 10 years. Staff at the Netcare Kuils River Hospital threw her a special send-off on Friday. 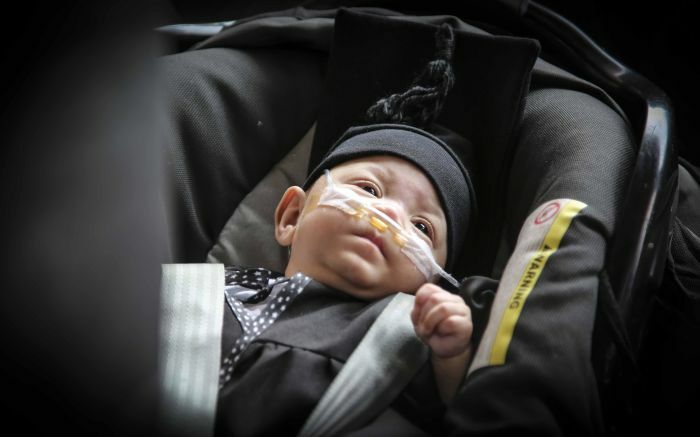 She went home after 275 days in the neonatal intensive care unit, dressed in a graduation gown and cap. The hospital's Claire Pitt says despite her tiny body, Baby Hope had a big personality from the start. And her mother battled with multiple conditions, including kidney disease and diabetes, making her pregnancy high-risk. At 24 weeks and four days, the mom's condition deteriorated enough that we had to have the Caesarean section. Pitt says Baby Hope, who now weighs just over five kilograms, thrived on breast milk, 24-hour nursing care, love and an incubator. The infant will receive ongoing care from a neonatologist, physiotherapist, speech therapist and trained nursing carer. We couldn't incubate and ventilate her because she was too tiny. There were no tubes that were small enough. She has gone home on oxygen, which we anticipated. She's had to grow a whole new pair of lungs. We will follow up and monitor as she grows from strength to strength. Maryke Cloete was found guilty for child negligence on Thursday. Judge Collin Matshitse found that the mother deliberately ignored the abuse of her child, which resulted in his death. Daniel's mother and her boyfriend are accused of abusing, neglecting and killing the three-year-old boy. The moving story of how Martin Pistorius recovered from a mysterious illness that left him unable to move or speak for 12 years.